Google will be offering special edition cases that extend from your phone to your screen. Once you download the Live wallpaper app, your phone’s screen will change throughout the day to feature some of the awesome pictures taken by Nanou. When the sun goes down your live wall paper will show you constellations based on your phone’s location. The case also comes with a customizable button that you can use to open up your camera, an app or even to check out Skrillex’s music. 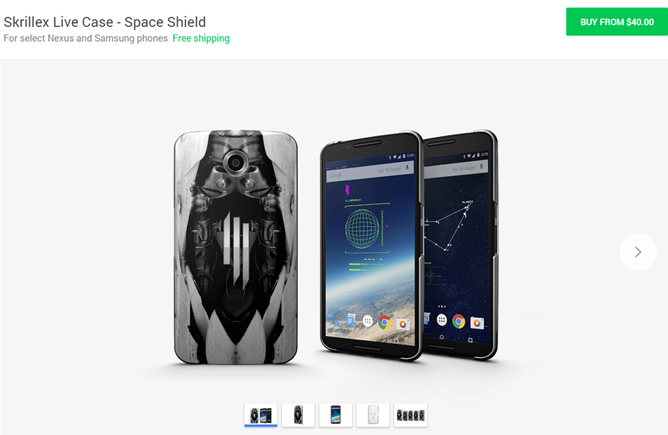 Buying the case will also get you an early look at some of Skrillex’s favorite artists on OWSLA. Once Nanou is done photographing the pale blue dot, one super lucky fan will win the autographed satellite. The cases start at $40 and are available on the Google Store. You’ll need to have either a Nexus 6, Nexus 5, Samsung Galaxy S5, Samsung Galaxy S6, or Samsung Galaxy Note 4. They’re available starting today until the end of June. Google also posted a short documentary video of Skrillex talking about his fascination with space. You can watch the video here. If you’re interested in grabbing one of these cases be sure to visit the Google Store here. There are a couple different designs that range from circuits to space shields. Will you be grabbing one of these cool cases?